As the weather outside warms up, the kitchen can be a terrible place to be. There are many things you can do however, when it comes to cooking a nice homemade meal that doesn’t require traditional stove top or oven cooking. Learn to utilize some of the lesser heat producing equipment in your kitchen, such as the crock pot, in order to truly beat the summer heat and keep your cool while preparing a nice hot meal for friends and family. How does crock pot cooking really help beat the heat? Simply put, the crock pot in and of itself puts off far less heat when cooking than an oven or stove top. This is the first and possibly the best reason to utilize the crock pot in your summer meal planning. You should also consider the fact that using a crock pot to cook with will not heat the house and therefore preventing your air conditioning (or other cooling methods) from working overtime in order to compensate for the additional heat that other cooking methods introduce. Unfortunately, the general consensus has been that crock pots are meant for comfort foods and hearty winter meals. The truth is that the crock pot should be one of your best loved and most often utilized cooking methods if you can manage it. When it comes to cooking with a crock pot, the options are almost limitless. Almost anything that can be baked can be made in the crock pot. That includes many wonderful, enticing meals and treats. In addition to the cost benefits mentioned above when it comes to crock pot cooking there are many other benefits that are well worth mentioning. First of all, the bulk of the work involved in crock pot cooking takes place early in the day when you are refreshed rather than at the end of a hectic work or play day. This means that you are less likely to forget an ingredient or make other mistakes that often occur as we hurry to prepare a dinner when we are exhausted from the activities of our day. Second, many great crock pot recipes include the vegetables that insure we are getting the nutrients we need. So often, when preparing a meal at the last minute, we may open a can of vegetables (in most cases canned vegetables have little to no nutritional value) in favor of expedience. Crock pot cooking in many instances is a meal in one dish. Another great reason to use a crock pot for your summertime cooking is the ease of clean up. Unlike pots and pans, most crock pot meals are made in one dish. This means that there will not be mountains of dishes to be either hand washed or loaded into the dishwasher afterwards. You can spend less time cleaning just as you spent less time slaving over a hot stove. Once cleanup is complete you can get back to enjoying the sun set, chasing the lightening bugs with your little ones, or waiting for the first star. 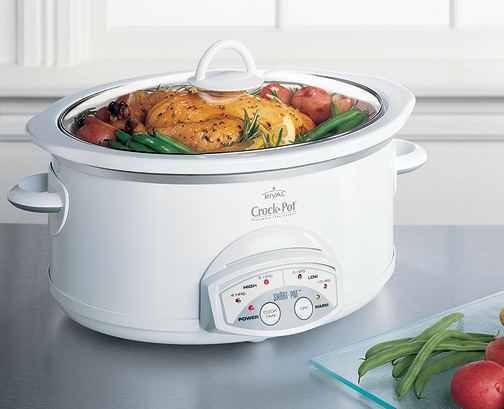 Here’s a great article we posted on the safety of crock pot cooking: Slow Cooking, Is it Safe? This entry was posted in Reviews - Kitchen Utensils - Cooking - Food and tagged Air conditioning, Comfort food, Cook, Cookware and bakeware, crock pot cooking, Kitchen, Meal, Oven, Slow cooker. Bookmark the permalink.